Modern Italian fare using locally sourced, seasonal ingredients for house-made pastas and pizzas. 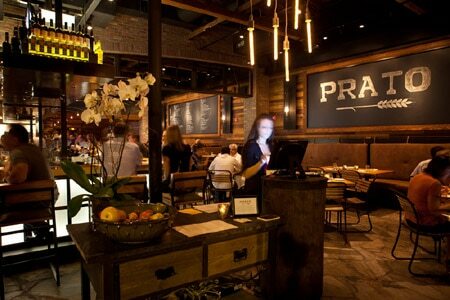 : Helmed by executive chef Brandon McGlamery, Prato offers a taste of Italy with a contemporary, local flair on Winter Park’s bustling Park Avenue. Many of the dishes, from the pizzas to the whole yellowtail snapper, are baked in wood-fired Acunto ovens imported straight from Naples, which impart an earthy wood-charred flavor. Though the menu is ever-changing depending on what’s in season, popular mainstays include the “Widowmaker” pizza topped with arugula and fennel sausage, baked with a fresh farm egg right in the center that’s an ideal dip for the pizza crust. House-made Laughing Bird shrimp ravioli is mixed with a red scampi sugo, topped with broccolini and dusted with pangrattato (breadcrumbs). The setting is rustic farmhouse chic, with walls lined in wooden panels and decorated with hanging potted plants.